"Listen! Listen very carefully! If you ever hear a sound like this, run for your life! Run, run before it is too late, for if you stay you will lose your soul!" Awhile back, I had the misfortune of needing all 4 of my wisdom teeth removed along with 2 other molars. While recovering, I spent my days essentially watching anything I could get my hands on hoping to take my mind off the pain and discomfort. I managed to locate a video rental store that had a copy of the original British TV version of the famous Quatermass and the Pit from 1958. Despite a hefty length of a little over 3 hours, I found the film one of the most engaging and truly creepy experiences I've had in front of a TV set....and I forgot all about my teeth (or lack thereof). This was how I first became acquainted with Nigel Kneale's fascinating Professor Quatermass stories. Though there were only a handful of these shows produced for British television in the 50's and 60's, I found them as examples of how strong writing and effective direction could make you care less about shoe-string budgets and cheesy sets. In the early 50's, Hammer Films decided to make theatrical versions of the Quatermass stories with slightly higher budgets and different casts. 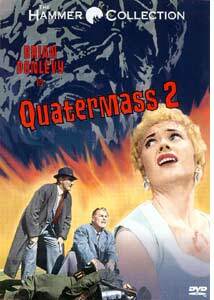 Quatermass 2 is based on the TV show of the same name with slightly simplified story and shorter running time. As the film opens, Professor Quatermass is practically killed by an out of control car as he travels to his rocket lab. One of the passengers in the car is delusional, with a strange injury to his face caused by a falling rock. Once Quatermass actually arrives at his rocket project, he discovers that his staff has been radar-tracking strange objects falling from the sky. After an analysis of the rock that hit the man in the face reveals semi-intelligent construction and symmetry, Quatermass decides to investigate where the rock came from. Eventually he locates a secret government project where guards are armed to the teeth, and where the workers turn on anyone who ask even simple questions. The mysterious rocks and the secret project are somehow connected, leaving Quatermass to dig even deeper. Few people will listen or help, and the Professor meets resistance at every turn. Eventually, Quatermass suspects some sort of strange conspiracy that might even involve beings from outer space. The film, in many ways, is a metaphor for the feeling many Britons had regarding the secrecy of military projects in post-war England. Despite its age, Quatermass 2 is a stylish and crafty piece of work that captures this paranoia. The black-and-white cinematography is entirely bleak with overcast skies, and the sets used are purposefully sterile and bare. The town where the workers are culled for the secret government project was an actual post-WWII community. The repetitive homes and bland architecture typical of these communities only serves to increase the sense of isolation in the plot. The actual government base itself was filmed in a giant oil refinery, again adding to the surreal quality of the film. As one might expect, Quatermass 2 is a simplified version of the original television version, since the original was 3 hours long. The film also has a different cast, though Brian Donlevy returns from The Quatermass Xperiment to play Professor Quatermass. Unfortunately, Brian Donlevy's performance is one of the weaker elements of the film, as making Prof. Quatermass' character a sort of rough-and-tumble American takes much of the intelligence from the role. Donlevy seems too tough and no-nonsense to play the tactful and cerebral Professor. Some of the original scope of the film is also compromised for this shorter running time. However, Quatermass 2 marks the first time that creator Nigel Kneale was actually involved with the theatrical production and script writing. Image Transfer Review: Using an archival print (from the British Film Institute), Anchor Bay did a superb job with a film of this age. Although the first few minutes of the film are noticeably eroded (which Anchor Bay warns the viewer about), the rest of the film is clean and sharp. The image does have some compression problems and background shimmer, but this is mainly because the high level of grain and artifacts on the source print. It's obvious that the disc represents the best that could have done with this film. Audio Transfer Review: The Dolby Digital Mono soundtrack is actually very surprising. Typically, we're used to old films like these having choppy dialog and major problems with balanced volume. This is not the case here. All of the elements from dialog to music have very good frequency response and are well balanced. The audio is confined to the center channel only, but it's rich enough that, unlike many mono films, it doesn't distract you. Again, the best that could be done, has been done. "World of Hammer" episode: Sci-fi. Extras Review: Much to my complete surprise, the disc contains a commentary track featuring both director Val Guest and Quatermass author Nigel Kneale. They are not actually together on the track, but rather the commentaries were recorded separately and combined together. There are also 2 interviewers on the track, but their names are not mentioned. The commentary is very informative and filled with production anecdotes and insight. It becomes obvious early on that Nigel Kneale, like me, disliked Brian Donlevy as Prof. Quatermass and that he was quite disappointed about not being part of the original The Quatermass Xperiment. Considering how influential both Val Guest and Nigel Kneale were to the British sci-fi realm, the commentary track is a real treat. My only complaint is that, at times, the movie volume clashes with the commentary volume and it's hard to distinguish either one. Like many discs in Anchor Bay's "Hammer Collection", this one contains an episode of the World of Hammer series. Focusing on the sci-fi films Hammer made, the episode isn't really a documentary, but rather a series of clips from these films. I would recommend that people who haven't seen many Hammer films (or Prof. Quatermass films) avoid this 25 minute feature as it contains some spoilers from other Hammer works. The feature is narrated by the late Oliver Reed who himself was in the Hammer classic The Damned (which is discussed in the feature). Unfortunately, many sci-fi films of this age tend to get lumped together as laughable attempts at serious entertainment. While a lot of 50's and 60's era sci-fi/horror films do have a laughable quality, usually in the form of outlandish plots, the Quatermass stories were easily superior to most sci-fi films. Rather than expecting audiences to be scared at the sight of a rubber-suit monster with laser beam eyes, Quatermass 2 turns Britain's own people on themselves. The film also has a strong story and relies on this more than special effects or action, although the film does boast some good effects for the time. Quatermass 2 is a definite reccomendation for anyone who appreciates these classic sci-fi mysteries, their low budget charm, and solid storytelling.